The Italy and Sicily tours package is a magnificent all inclusive journey through seven Italian regions, including the island of Sicily plus Calabria, Campania, Lazio, Tuscany, Umbria and Veneto. The all-inclusive Italy and Sicily trip itinerary visits many of Italy’s UNESCO sightseeing highlights. This escorted tour of Italy’s UNESCO Heritage sites travels round trip from Rome. Tour Italy’s and Sicily’s UNESCO world heritage destinations including: Greek temples in Agrigento, the ancient Roman city Pompeii, Byzantine Mosaics in Ravenna and Monreale, Vatican City, Assisi, Florence, Naples, Rome, and Venice. Along your journey you will see two Italian volcanoes Mt Etna and My Vesuvius. Visit Lucca and Pisa in Tuscany. Tour Sicily’s highlights including Palermo, Marsala, and Taormina. Drive along the Amalfi Coast to the Bay of Naples resort town Sorrento, and jet boat out to the splendid island of Capri. To book your Italy and Sicily vacation submit form below for the price of the all-inclusive Italy and Sicily tours with airfare from your city. 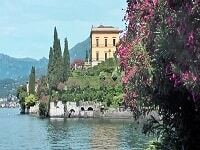 17-night Italy and Sicily tour includes first-class accommodations. 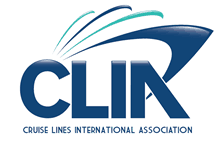 To review the Italy and Sicily tour daily itinerary click here. Check the box next to the Italy and Sicily escorted tour you would like to join. Price is land-only. For Italy tour with air enter departure airport to receive air itinerary with airfare to Italy. 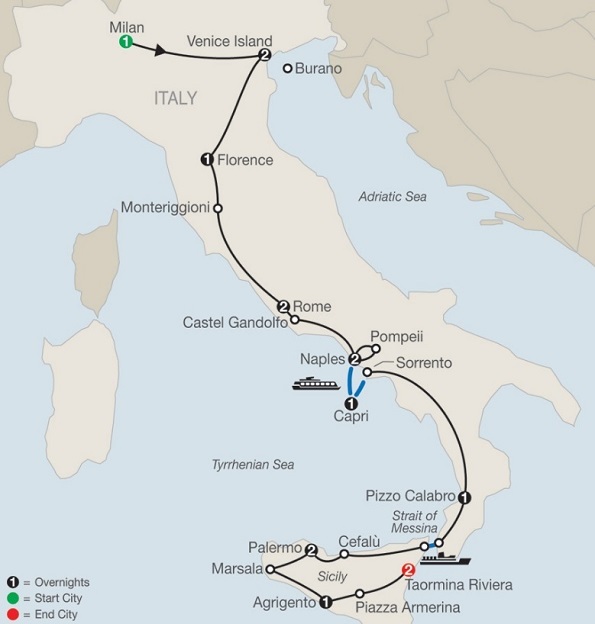 The Italy and Sicily tour travel itinerary. 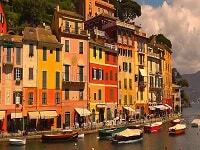 For the price of the Italy and Sicily tour with airfare included from your city submit the form. Depart the Unites States for your flight to Rome, Italy where you’ll begin your Italy and Sicily tour. Follow your Local Guide on a walking tour. Visit the SFORZESCO CASTLE GROUNDS and MUSEUM. Then, visit PIAZZA DUOMO with its magnificent gothic cathedral, the glass-domed GALLERIA, and admire the famous La Scala Opera House. Leave Milan and drive through the flat Po area to Venice, a favorite destination for romantics and art lovers from all over the globe. Enter in style by PRIVATE BOAT. Meet your Local Guide and walk to ST. MARK’S SQUARE. 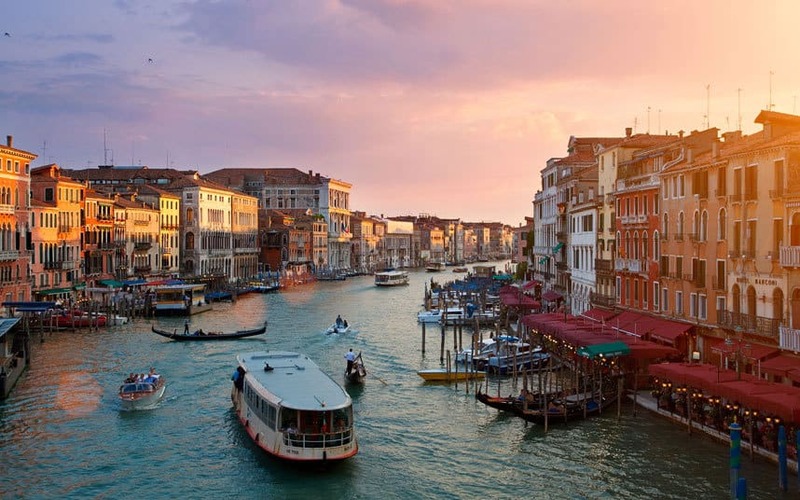 Visit the byzantine BASILICA, lavish DOGES’ PALACE, and the world-famous BRIDGE OF SIGHS. Watch a skilled GLASSBLOWER fashion delicate objects in an age-old tradition. 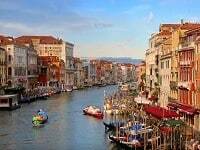 Time to explore Venice at your own pace or join an exciting optional lagoon cruise to the colorful island of Burano. A scenic drive across the flat Apennines brings you to Florence, “Cradle of the Renaissance.” With your Local Guide visit the ACADEMY OF FINE ARTS with Michelangelo’s celebrated David. Continue your walking tour through the historic center and stand in awe in front of the magnificent cathedral. Admire Giotto’s Bell Tower, the Baptistry’s heavy bronze “Gates of Paradise,” and the sculpture-studded SIGNORIA SQUARE. Afterward, you may wish to shop for Florentine leather goods and gold jewelry, sold by the ounce. Later, enjoy dinner at a local restaurant. Look forward to an exciting experience: a WALK ON THE RAMPARTS of the medieval town of Monteriggioni with beautiful views of the surrounding Chianti region before continuing to Rome. Guided sightseeing of the “Eternal City” starts with a visit to the VATICAN MUSEUMS and SISTINE CHAPEL with Michelangelo’s ceiling paintings and The Last Judgment, followed by a visit to monumental ST. PETER’S SQUARE and BASILICA to admire Michelangelo’s Pietà. Then, enjoy views of other major sites as you drive to the Roman Forum to visit the ancient COLOSSEUM, where gladiators once fought. Afterward time at leisure; optional excursions are available. Look forward to a unique experience: a guided visit of the impressive PAPAL PALACE in Castel Gandolfo, former summer residence of the popes and, since 2016, a museum that is open to the public. Also visit the magnificent BARBERINI GARDENS, where ruins of the residence of Roman Emperor Domitian are still visible. Then, continue south on the Highway of the Sun to arrive in the busy port city of Naples. In nearby POMPEII, the Roman city both destroyed and preserved by an eruption of Mount Vesuvius in 79 AD, join your Local Guide for an exciting visit to the excavations. See a patrician home, public baths, and shops that give a striking picture of what day-to-day life was like in Rome at its apex of power. Return to Naples, where guided sightseeing features the main sights, and visit the ARCHAEOLOGICAL MUSEUM, where many of the treasures that were recuperated from Pompeii are on display. Speed across the bay by JETFOIL to the Isle of Capri for your overnight stay. Ride the FUNICULAR to Capri Village, where guided sightseeing includes a visit to the GARDENS OF AUGUSTUS offering spectacular panoramic views. Spend the rest of the day to further explore this wonderful island at your own pace. Return to the mainland and spend time in the charming seaside resort of Sorrento. Drive south to Calabria for your resort overnight stay. Board your FERRY and cross the Strait of Messina to land in Sicily. Follow the northern coastline and arrive in spectacular Cefalù, where you will taste a traditional granita. Time to explore the old town with its medieval lanes and seafront promenade. Next is Palermo, the capital of Sicily. Sightseeing with a Local Guide features the ornate Piazza Bellini, Capo Market, the baroque Church of Immacolata, and a visit to the magnificent CATHEDRAL. Drive up to Monreale for a panoramic view of the Conca d’Oro and a visit to the 12th-century NORMAN CATHEDRAL, famous for its 50,000 square feet of precious byzantine mosaics. After a visit to a traditional SALT MILL in Marsala, look forward to a WINE TASTING at the famous Florio wine cellar to sample and learn about Marsala wines. Your next destination is Agrigento, where a Local Guide takes you for a spectacular walk through the magnificent VALLEY OF TEMPLES. Even travelers who have visited Athens and Delphi are awed by the gigantic yet graceful Greek structures that miraculously survived 24 centuries of tormented history. Enjoy the scenic beauty and treasures of the island’s heart on your way to Piazza Armerina, where a guided visit features the impressive VILLA ROMANA DEL CASALE with its mosaics. In Taormina, follow your Tour Director for a pleasant walk along Corso Umberto before arriving at your comfortable hotel. A full day at leisure gives you a chance to join the exciting optional excursion to Mount Etna. Spend the afternoon to relax or for individual activities. This evening, a farewell dinner at a local restaurant awaits. For more vacations to Italy and Sicily click Sicily tours packages.